Here are some pics of a recently completed commission from A&A. 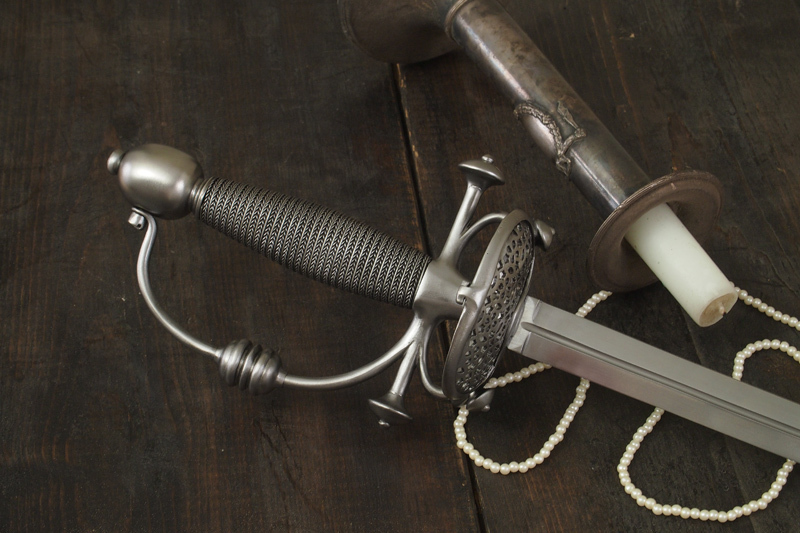 Its an elegant transitional form of smallsword with a pierced plate in the rings and dramatic knuckle bow detail. We worked on this piece for a very long time to get the form and plates to work well. We worked from just one picture of the hilt of the sword at a low front angle so it took some sorting to get the whole to work in three dimensions. We really appreciated the customers patience with our desire to get it right and hope the piece will be satisfying as he should have it in hand shortly. I do not have the specs to hand but it is roughly 41 inches overall, 34.5 inches in the blade and weighs about a pound. The customer asked me to post this thread and hopefully he will chime in with his opinion when customs finally gets their deal together. Super work. The wire detail quite excellent and the shape of the grip quite beyond par.. A step beyond would be contrasting colors of the hilt but this looks like quite a nice military smallsword form. I love the large finials and the plate piercings show the effort resulting in a fine example of work. I'd love to see the blade worked into a couple of standard and stock items. 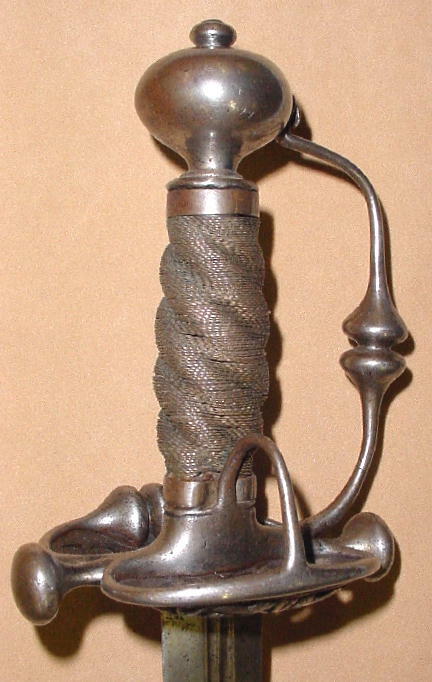 The loop hilt with this blade would surely do well. I think the customer will be quite happy. Stunning work. Not surprising of course....your custom work is always amazing. That is a very interesting piece. 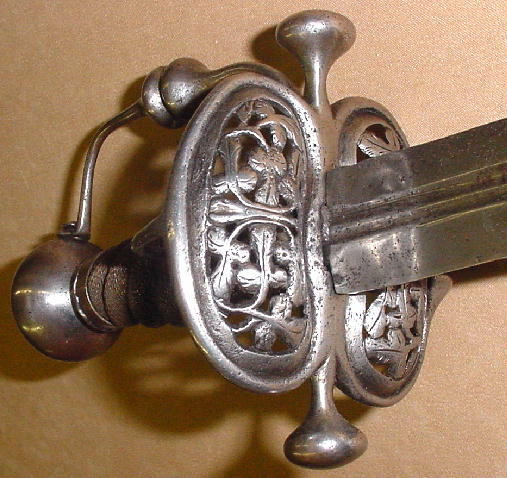 It looks like a hybrid between a smallsword and a 17th century campaign sword or felddegen. 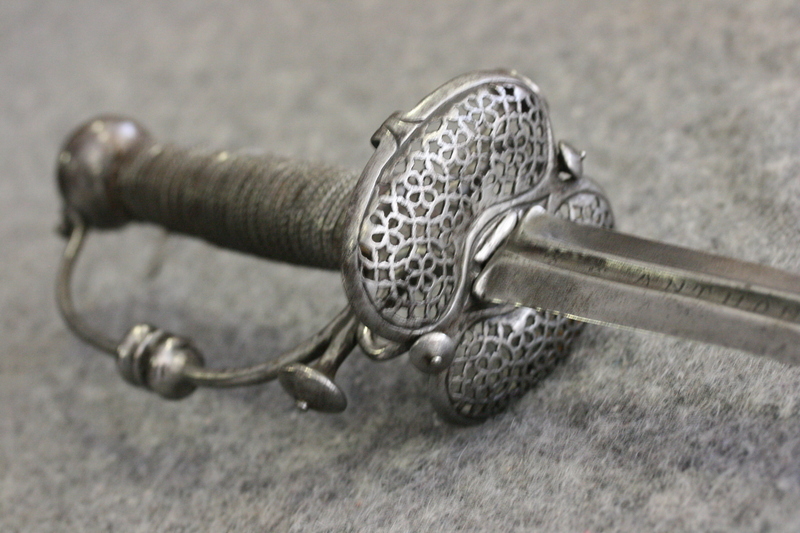 That big lobe on the knuckleguard and the pierced plates, among other things are reminiscent of the latter style. It reminds me a lot of the original shown below. (no thumb ring of course) I'm sorry that I can't remember specifically where or when it comes from. And let me say again - if you want a great custom piece, A&A is the place to go. Beautiful. You know, that almost makes me want a smallsword and that's quite a feat. Very nice work. I come to this site less and less to reduce the pain of envy. I have to ask though. - That long of blade and that much material in the guard and it is still only a pound? Absolutely gorgeous little blade.The transitional period between rapier and true smallsword is very ignored, so it is refreshing to see such a beautiful example of such ! I have to ask though. - That long of blade and that much material in the guard and it is still only a pound? The proportions of a smallsword often do not capture well in photos. 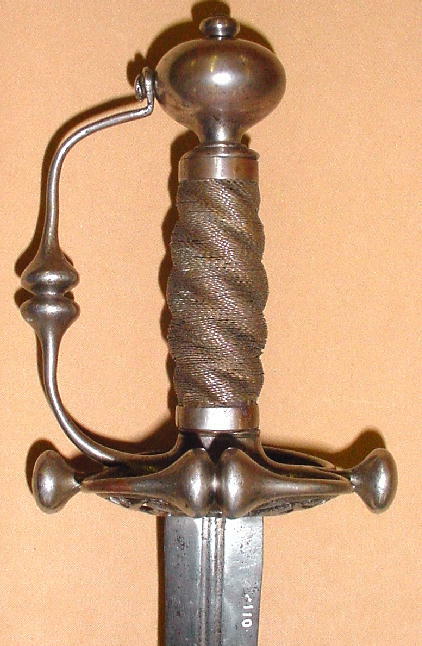 One often thinks more along the size of a rapier or spadroon hilt, but smallsword hilts are most often very tiny, I believe this sword is smaller in the hand than one would imagine. In fact, approximately 1 lb. corresponds well to the median weight of historical examples from the period. YUP, not my kind of preferred sword but I can't help being impressed by the design, and the craftsmanship is impressive beyond words.. 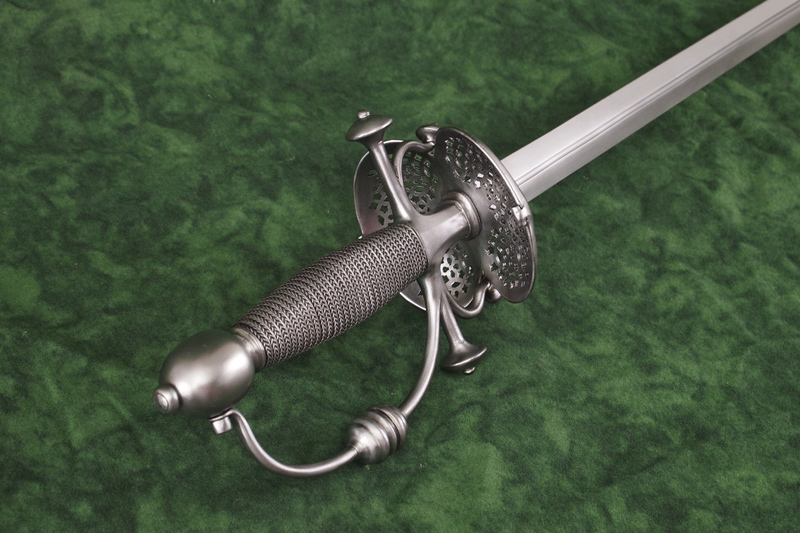 I am asking the question as a fellow who had an A&A custom smallsword completed last year. 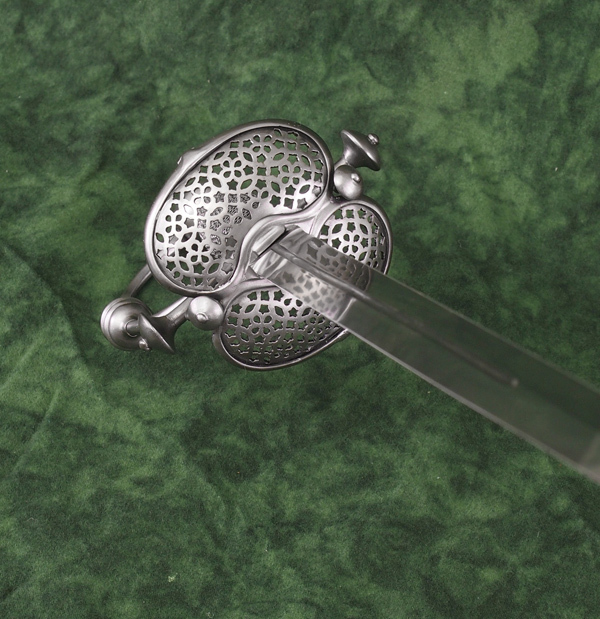 Mine was much simpler though, a modest variation on the English loop hilted smallsword originally commissioned by Stephen Fisher. Among other things I asked for a slight more "militarized" blade - a bit longer, wider, and heavier. Still three and a half inches shorter than this one though. With a less robust looking hilt it came out to 1lb 3.5 ounces. This all leaves me wondering more about this new blade which we don't get to see much of in pictures (yet). I am anxious to hear about it's mass, stiffness, balance, and even rotational behavior. Amazing work ! I really need to start another sword project *sigh*. The pierced plates pattern - not an easy thing to do. It may have taken more than one go around with the plates, to get them perfectly right. As far as I can tell this is almost exact in detail.